Gold specimen from Montague, 23.9 Troy ounces of gold. Gold formed in Nova Scotia in our geologic past when the tectonic plates of drifting continents collided, pressing layers of rocks into folds and creating a lot of heat. This heat caused hot, quartz-rich fluids to ooze through the folding rocks, dissolving and concentrating gold. As the hot quartz-rich fluids cooled, gold formed into veins. Most of the gold in Nova Scotia occurs as these quartz vein deposits. 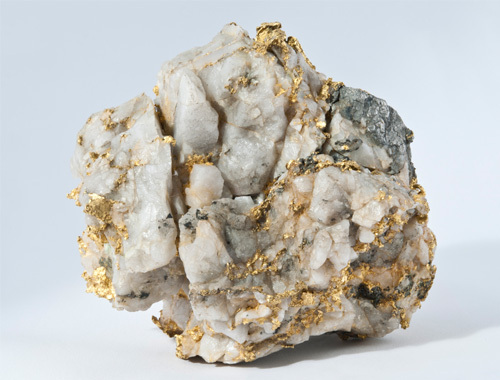 Sometimes a chunk of quartz on the ground can be found to reveal a strand of gold, but mostly vein gold only can be obtained by digging a mine. 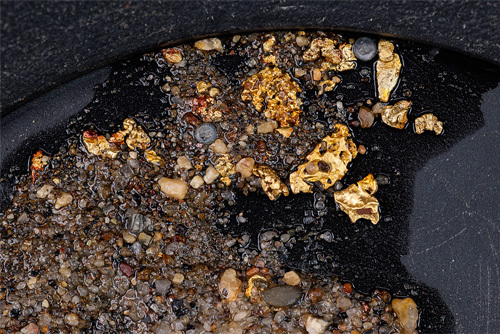 Gold nuggets in the slurry in a gold pan. Gold also is found in smaller amounts as nuggets called placer gold. Placer gold forms when river water erodes an older gold deposit, laying it down elsewhere in the river as flecks and nuggets. This can be retrieved by panning. River sediments are gathered in the pan with water and swished around. Gold is heavier than sediment and sinks to the bottom of the pan. Pyrite, Beaverbank, Nova Scotia. Courtesy of Fred Walsh, Prospector. Be sure not to confuse gold and “fool’s gold”. 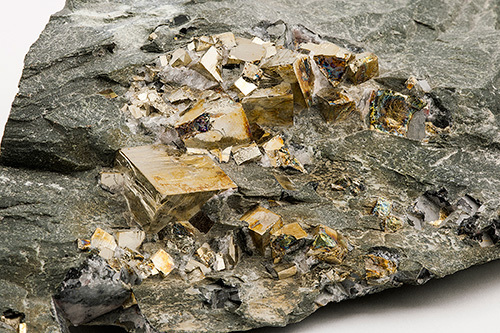 Pyrite, known as fool’s gold is shiny and yellow. But pyrite is brassy yellow and often forms in cubes; gold is a brilliant, radiant yellow and tends to form in the shape of wire, leaves, or nuggets.